Everything Beauty and Beyond! 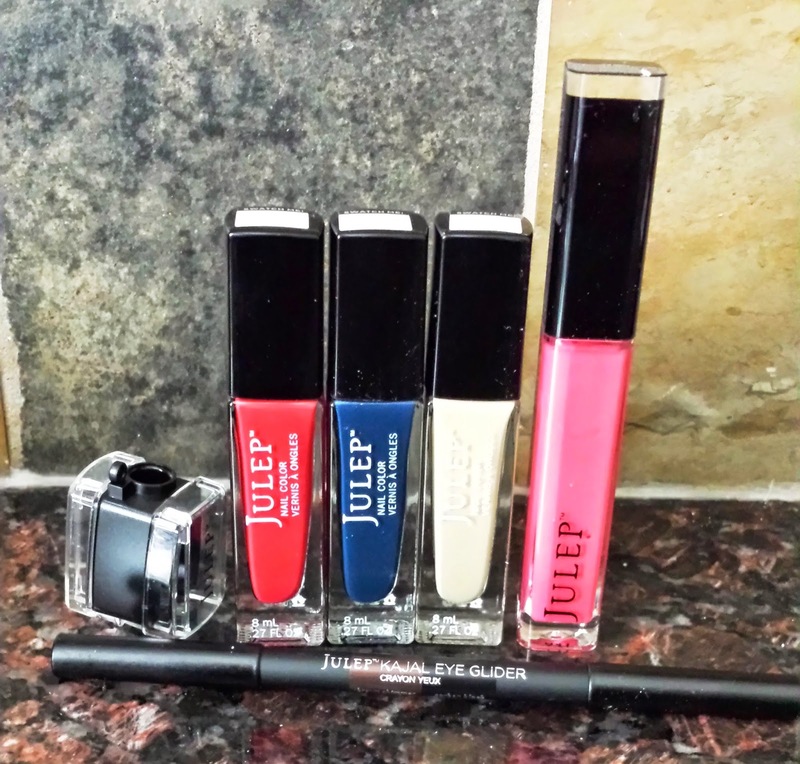 : Julep July & August Maven Box! Julep July & August Maven Box! In my whole time of being a beauty writer I have never been part of any beauty box program till now. The reason why was because the majority, while they made good, only give you small samples of products. The more expensive beauty boxes offer higher end products at either full or large size samples. However those also come with a heft price starting at $40 a box. To be very honest with you, I only like sample sizes of things I actually plan to buy. Having small samples of products I don't care for lying around really doesn't do it for me. Moreover a lot of these boxes offer some of their samples on those tear away packets which I dislike even less. You have to tear the packet at the top and use it quickly before it dries. Its also hard to control how much product comes out when you are squeezing a small sachet. My friend told me about Julep Maven and informed me I should sign up to check it out. Julep Maven is a company started about 4 years. They sell nail polishes, skin, body, hand and feet care products. This also have a whole section for makeup. You can shop from their store whether you are member or not. However the price is cheaper when you are a member on all products. I was first hesitant to sign up, as I didn't want to blow money on products or samples I would never use. However when I realized that my first box was costing $2.99 and that included FREE shipping to Canada! SOLD! I signed up and bought it! I had two options of membership. Either a pay as you go which would come out to $24.00 US a month, or a 3 month membership for $19.00 US a month. Since I didn't know what I was signing up for, I did the $24.00 a month. My first order of course was only $2.99! Also, if I didn't like what I received in my first order, I was able to cancel my subscription before the 24th of the following month. I actually thought that sounded like a fair deal. Now here is the selling point of the Julep Maven box. You are able to FULLY CUSTOMIZE this box every month! So if you don't like what you are getting in the box; between the 20th and 24th of the month you can swap in and out products and get the box you want! You also rack up Julep points for every box you buy so at 2000 points you can get a free box! My welcome box came loaded with awesome goodies! I received three nail polishes in the color red, dark blue and a mustard yellow. I also received a lip gloss, black eyeliner and sharpener. I also received a coupon code for 50% off anything on my next purchase! Which I gladly used! Out of the three nail polishes I didn't like the red one as it was not dark enough of me. The blue was totally not my style, however I did apply to my toes which gave it a unique touch! the yellow mustard colored nail polish did look lovely on my hands and I rocked it for about two weeks. The nail polish wasn't to thick or to thin and coated my nails just right. The lip gloss is very nice and smooth, however just a bit to pink for my skin tone. I haven't used the black eyeliner yet but the sharpener is awesome! It encases the shavings so that you don't get them all over the place and you can surely travel with this sharpener which is useful when a trash can is not around. The only complaint I have about this box is that I didn't get to customize it. Had it been left up to me I would of swapped out the red or blue nail polish and gotten the lip gloss in a different shade. Or totally different products. Nonetheless I was able to fully customize my second box and I so happily did! In my second Julep Maven box I received everything I wanted and more since I was able to pick everything in the box! 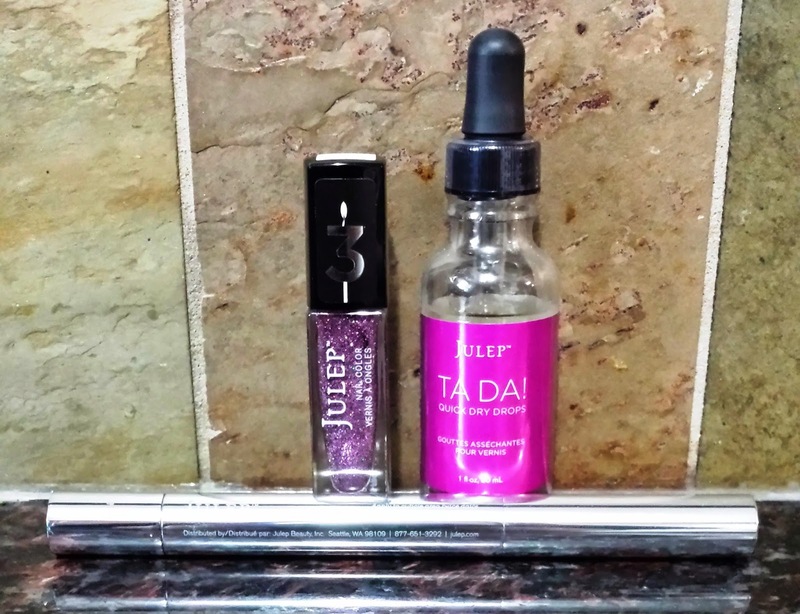 I received a lovely purple sparkly nail polish, 'Tada' quick dry drop formula and a Mighty Nail & Cuticle Serum. I have to say the pretty purple colors in this box really put me in a nice mood! I like the color lavender so this really reminded me of it! I decided to picked a beautiful nail polish that I knew would look awesome on my toes. I normally wear colors on my toes, but ONLY the French or very light pinkish tone colors on my hands. I also received a product called 'Tada' which comes in a droplet bottle that you apply on your nails after applying your polish in order to help it dry quickly. My Julep Maven box also came with a Mighty Nail & Cuticle Serum. I recently tried this serum and I have to say I really liked it. It conditioned my nails and cuticles very nicely and got rid of all the dryness I normally get in that area due to constant hand washing. I have to say I really like Julep Maven Monthly Subscription Box and don't regret trying it at all! If you are interested in trying this subscription box out, than feel free to click here --> Use code HOORAY to get your first monthly box of beauty FREE! When you checkout, type in the word "hooray" to pay only $3.99 for shipping (in the US and Canada). Remember if you don't like it, you can cancel it at anything before the 24th of the follow month! You can also skip any box you want once you become a member and not pay a cent that month or lose your membership! If you end up trying out the box, or you have tried out the box before, feel free to let me know your thoughts!